Brad Keselowski, driver of the No. 22 Ford, led Kyle Larson, driver of the No. 42 Chevrolet, and Ryan Preece, in the No. 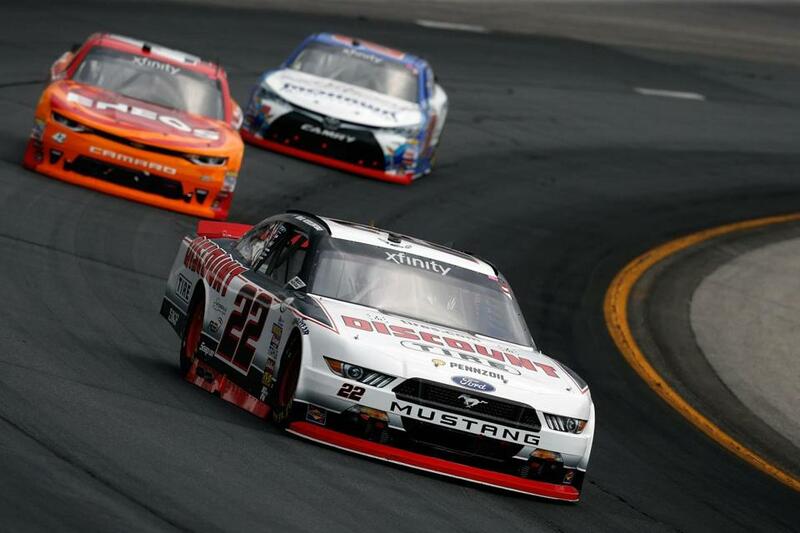 20 Toyota, dring Saturday’s NASCAR Xfinity Series race at New Hampshire Motor Speedway. LOUDON, N.H. — For NASCAR drivers, conviction on the racetrack is paramount. One needs a sense of assuredness to take a turn at over 100 m.p.h. in front of thousands of screaming onlookers. But heading into Sunday’s festivities at New Hampshire Motor Speedway, certitude is in short supply due to a seemingly benign chemical: PJ1. A traction agent that dries like glue after being applied to asphalt, PJ1 - also known as VHT – is used in part to provide drivers with ample opportunities to pass, something that hasn’t always been easy at New Hampshire’s 1.058-mile oval. But as this weekend has proved, it’s not always that simple. When the Overton’s 301 kicks off, Sunday at 3, NASCAR Cup Series drivers will experience a different racing surface than what they’ve become accustomed to the past two days. The balmy temperatures projected for Sunday afternoon will nullify much of the experience drivers gained practicing in more overcast, misty weather on Friday and Saturday. Even the practice sessions at NHMS have been accompanied with an air of trepidation. “Courage,” Ryan Newman said with a laugh when asked why cars seemed to be faster on the second lap than the first. There are myriad factors at play. Which lanes are striped with PJ1? How does one not lose control when transitioning from a lane with PJ1 to one without it? Can the traction agent last without wearing off, as it reportedly was on Saturday after Kyle Busch’s XFINITY Series pole victory? Members of the NASCAR Cup Drivers Council are responsible for the change. “The question got put out to a lot of different drivers this week from the council,” said New England native Joey Logano. “We kind of got on our group chat and were talking back and forth about what we thought was best. Added excitement is the goal. Last Saturday at Kentucky Speedway, Kyle Larson surged from his starting position in 40th – his No. 42 Chevrolet failed inspection before qualifying – to a second-place finish, scaring race winner Martin Truex Jr., who had at one time enjoyed a lead of 15-seconds on the field. After winning the pole Friday, Larson suffered a similar fate at NHMS, failing a post-qualifying inspection due to an illegal rear deck fin lid. Larson was stripped of his pole victory and will start Sunday’s Overton’s 301 in the 39th and final position. Another challenger to Truex’s throne, Joe Gibbs Racing’s Denny Hamlin, struggled to acclimate in Friday’s practice session, wrecking his No. 11 Toyota after losing traction on a turn and careening into the inside wall. Hamlin acclimated nicely on Saturday, posting a third-best time of 29.171 seconds in the final practice session despite being relegated to his backup car. Still, Sunday figures to be a different beast. “We will see how [it] works,” Logano said. “It is something that could be a larger deal than we all think, for sure. But definitely there is a lot to learn about it. How long it lasts in a race, where is the right place to put it on each track. Owen Pence can be reached at owen.pence@globe.com.